What’s the best gas-powered wood chipper for Homeowners? Wood chippers are invaluable if you love to ensure your yard and garden a wood chipper will take your branches and other yard debris and transform them into mulch, compost or wood chips. I feel these are underappreciated tools and a wise investment for homeowners. As a homeowner, your garden is most likely something that you take great pride in. Keeping your yard in tip top shape can be a lot of hard work. To make your life easier, you probably have tools of every shape and description, all designed to take the stress out of garden maintenance and save you time. A wood chipper and garden waste shredder is one tool that makes a big difference in the way that you approach yard cleaning. It assists you in two ways. By shredding leaves and chipping branches into small manageable sizes, a wood chipper makes yard cleaning much easier. The benefit of having your garden debris broken up like this is that it’s instantly available for mulching. This also means that it’s super easy to turn your garden waste into usable compost. So you’re getting the best organic fertilizer for free and with very little effort. A gas-powered wood chipper is going to give you the best power and you’ll most likely be able to get through a lot of yard waste much quicker than you would with an electric machine. They will also be able to make light work of bigger branches and twigs. A good quality wood chipper is going to set you back a bit, they’re not the cheapest yard tools. But if you choose the right machine, you’re going to get many years of hard work from it. The tons of compost that you will be getting, as a result, will make the investment well worth your while. This article should give you the information that you need to make a wise decision. So before you go about spending your hard earned cash on a gas-powered wood chipper, take the time to read the reviews of the machines that we’ve selected. We’ve chosen the best gas-powered wood chippers in the opinion of many homeowners. There are quite a few factors that you’ll be taking into account when choosing the best gas-powered wood chipper your needs. Affordability is a big concern on everyone’s minds, so we’ve chosen quite a number of options in various price ranges. Quality is key when making any purchase. In this regard, we’ve only chosen wood chippers that are regarded as the best and therefore offer you the value that you want. At a convenient 25.4″ wide by 29.9″ long, it takes up minimal room in your garage or shed. Power through 3” diameter branches + leaves and twigs. ✓ View or download the MANUAL or TECH SPECS for the Tazz K32 wood chipper. If you’re prepared to pay a bit more for the Tazz K32 wood chipper/shredder, I don’t think you’ll be disappointed. It has a larger engine than the Yardmax YW7565 yet it’s quite a lot lighter and its design makes it a bit easier to move around. This is also a really tough piece of machinery, designed to take the rigors of garden work in its stride and just keep on going. The 212cc Viper engine is designed as one of the most durable 4-stroke gas engines. Not only will this engine outlast most others, but it also delivers a reasonable amount of power – 8.86 Ft LBS of torque. Strangely, this is slightly less than Yardmax YW7565 that has a smaller engine. Though the power difference is negligible and you won’t notice it when using either wood chipper – they both perform exceptionally well. With 2 X J-hammers, 2 X tri-hammers and 2 blades, it’s up to the task of shredding all your garden waste effortlessly – making light work of branches up to 3” in diameter. It has a very impressive shredding ratio of 20:1. Another cool aspect to the Tazz K32 wood chipper is the inclusion of a large and durable collection bag. The debris bag is made from incredibly strong fabric and has a number features that will really simplify your yard clean-up. It has cool carrying handles and a zipper at the bottom which make it really easy to empty. The bag also has a dock-and-lock connector, so you can remove and replace the bag in a matter of seconds. The Tazz K32 also has some great optional extras like a vacuum kit and tow bar. A weight of 121 LBS is a pretty impressive achievement for a machine that’s constructed from highly durable steel components. If that wasn’t already enough, the really large steel-rimmed 11” all-rubber (never flat) wheels make it super easy to move over bumps and dips. But wait, there’s more, it has an excellently designed handle that’s positioned to balance the weight perfectly. Excellent value. Good build quality. Overall, a great set of features. The hopper design is also perfectly thought out. At a height of 51”, it’s easily accessible and you won’t be lifting too high when feeding your garden debris into it. Made from thick steel with a really durable coating (looks like powder coating to me), the hopper will won’t scratch easily and this means there’s very little chance of it rusting over the years. It also has a handy feeder for branches and twigs near the bottom which has the same durable coating as the hopper. Designed as much for durability as it is for ease of use, the Tazz K32 is also light, easy to transport, and stores just as conveniently. This is a fantastic machine with a super impressive 5-year warranty. This warranty extends to the engine as well, which is truly remarkable. 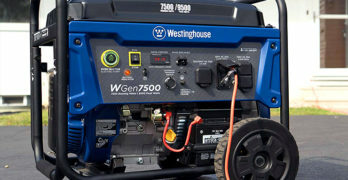 How many gas-powered garden machines have a 5-year warranty on the engine? The Tazz K32 is a wood chipper that will endure the harshest conditions and continue to offer performance that’s hard to beat. Read our comprehensive review of Tazz gas-powered wood chippers. They have a nice range of models to satisfy your needs and fit any budget. Chipper Chute accommodates up to 3″ branches. Moving up to an even higher price bracket is the Champion Power Equipment 100137. For the extra cash, you’re going to get quite a bit more. The first big difference between the Champion Power wood chipper and the previous two is its much larger engine. The Champion Power Equipment 100137 is driven by a mighty (EPA compliant) 338cc 4-stroke engine with a 1.6-gallon gas tank. Using really durable, hardened steel, 13.8” blades and four hammers, the Champion Power Equipment wood chipper will reduce your garden debris to pieces measuring ½’ or less. You feed the debris through a wide steel hopper that stands at a very convenient height of 49.4”. It also has an intake for branches which is very conveniently placed and will handle branches up to 3” in diameter with ease. Built to the same high quality standard as the others, the Champion Power Equipment 100137 is made from strong steel components and has 12” solid wheels. The wheels, together with a handle, make it quite easy to move the machine. I think they could have positioned the handle better, though. The weight is fairly reasonable for a wood chipper of this size and power – 191.8 LBS. It also has a debris collection bag that holds 2 bushels. Practice safety at all times. Always read the manual of your wood chipper. The Champion Power Equipment 100137 is another example of a well-made and durable piece of machinery. With its really powerful engine and excellent engineering, it has earned a rightful spot among the best gas-powered wood chippers for homeowners. Backed by Champion Power Equipment service and a 2-year warranty means that you can make your purchase with complete confidence. The warranty may not be as impressive as the Tazz but, then again, few can compete with a warranty like that. One of the best gas-powered wood chipper / shredder for the money. Heavy-duty wood chipper/shredder can tackle all of your yard needs. Solid steel casings provide the durable parts necessary to handle rugged jobs, time and again. As the cheapest wood chipper in this review, the Yardmax YW7565 offers you outstanding value for money. Yardmax garden tools are the number choice for many homeowners. This is because they are durable, easy to use and come at a very reasonable price. You can see, immediately, that the Yardmax YW7565 gas-powered wood chipper is designed and built for hard work and is a machine that will keep doing so for years and years. This is clearly evident in the abundant use of steel in its construction. From the sturdy steel tubing stand to the hopper and chute, every part of this machine displays purpose and durability. Large pneumatic 10” X 4” wheels also attest the durability of this machine and make it very easy to move around your yard – even over pretty rough terrain. Powerful enough for homeowners and professional contractors. A wide hopper with an opening of 21” X 14” means that you can feed loads of garden debris through the wood chipper, quickly and easily. You can shred branches up to 3” in diameter and there’s easy to use chute for feeding twigs and branches effortlessly. Debris is shredded at a 10:1 ratio and is discharged through an adjustable chute so you can easily collect your garden waste – ready for mulching and composting. Working efficiently, even with relatively large branches is a breeze, thanks to the powerful 208cc OHV 6.5 HP engine, delivering 9.5 Ft LBS of torque. The engine is not only perfectly powered for the job at hand but is also very fuel efficient, as well as being CARB and EPA certified. You have no worries about emission regulations, even in states where these restrictions are severe – like California. The engine drives two steel blades that that can handle a good deal of punishment without retarding their performance. Clever design makes this wood chipper easy to maintain. The gas tank holds 3.25 quarts, so you can work for quite a while before refilling the tank. With all that steel and its durable engineering, the Yardmax YW7565 is a heavy piece of equipment – 200LBS heavy. Fortunately, those large wheels take most of the strain out of moving it and it rests firmly on the steel base. It’s also designed for quick and easy maintenance, with easy access to the chipper blades. You’ll be amazed at the quality that you’re getting for very little money. Of course, when I say very little money, you must take this in context. A wood chipper with a steel hopper and chute, a powerful engine and all around excellent build-quality is not the cheapest garden tool you can get. Though, I’d say that for the price you pay, you’re getting a very good deal. The Yardmax YW7565 comes with a 2-year warranty for residential use (90-days for commercial use). Durable and efficient gas-powered wood chipper. Industrial strength wood chipper will easily digest your yard waste. ✓ View or download the MANUAL or TECH SPECS for the Generac G384173. Competitively priced, the Generac G384173 wood chipper compares well to the others and has many similarities and some outstanding engineering that sets it apart in some respects. As one would expect from one of the best wood chippers, this model is also constructed from solid, durable, steel and is going to withstand the test of time. The Generac G384173 is powered by a 208cc OHV 4-stroke engine with a 3-quart gas tank, so it compares quite closely to the first two wood chippers in this review when it comes to engine size. Producing 9.5 Ft LBS of torque also places this wood chipper up there with the best of them. Where the Generac may be slightly superior to most others is in the 8 free-swinging hammers which should make the job quicker than the four hammer design of the other machines. It also has a really tough PRO-SPEC hardened steel blade, reducing your garden debris down to half an inch or less. Like the others, it has a branch intake that can handle debris up to 3” in diameter. The hopper is large and durable, standing 47” from the ground with an opening of 18.5” X 12.75. It also has very good 9” wheels with a high profile and a sturdy stand. This certainly helps to make the 126-pound machine easier to move around your yard. Two gripping positions at the top of the hopper do a lot to aid you when moving the wood chipper. Like many others, the Generac G384173 has a debris collection bag with a particularly large capacity of 2½ bushels. Two year warranty for residential usage. Generac is renowned for manufacturing a wide variety of quality gas-powered products, everything from generators to gardening tools. They have the experience and dealership footprint to offer you the service you want. The Generac G384173 comes with a 2-year warranty. Commercial-grade gas-powered wood chipper/leaf shredder. This machine is exceptional. Built to last. Feed branches up to 3 inches in diameter into the cone to make coin size chips. 3 inch diameter chipping capacity. Triple-layered rotor is laminated for greater strength. Greasable outboard bearing supports the rotor, taking the load off the engine shaft for longer life and smoother running. Processed material will be discharged up to 5 ft from the machine or into the stanard collection bag. Powered by the strong, quiet, and easy starting Honda GX engine. With a price that’s double (or perhaps more) than the cheapest wood chippers in this review, you’re going to expect the Patriot CSV-3090H to be the best. I doubt many homeowners will want to pay this much more for a machine that does basically the same job, but for those who want a wood chipper that’s closer to a commercial grade machine, you’ll see the extra value you get from the higher price. For starters, it uses the Honda 9HP GX engine which is probably the most durable and reliable 4-stroke gas engine ever built and it’s compliant with emission regulations in all 50 states. Plus, you get the excellent service backup that comes with any Honda engine. It’s understandable that this engine is going to add to your price, Honda isn’t cheap. Though you would expect more than just this to justify its much higher price tag. I’d say that the engineering that makes for durability and better service does go beyond the indestructible engine. It has a direct drive shaft which further prolongs the life of the machine. In addition to this, it has a greasable outboard bearing which is designed to relieve most of the stress on the shaft. Another important aspect to point out is the reinforced mounting for the blades on the rotor, this allows the Patriot CSV-3090H to endure more punishment than most other wood chippers. The superior quality blades and 6 heavy, hardened steel hammers will pulverize your garden debris at a ratio of 20:1. The machine itself is very compact (24” X 35” X 37”) and is not too heavy either – weighing 149 LBS. Like the others, it has large wheels for easy transportation around your yard. It comes with a debris collection bag, which is also of the highest quality. There’s an option to buy the jumbo collection bag that will handle a lot more debris. Other optional extras include a cover, a tow bar, and a gator grip. You can also get the chipper buddy which assists in pushing debris through the machine with greater safety. Using the Patriot Products CSV-3090h is very much the same as the others, it can handle branches up to 3” in diameter. It also has a wide hopper and branch-feeding cone. Where the Patriot beats the others is in its materials and design. It’s made to work hard and is, therefore, the best for homeowners who do a lot of wood chipping and is even suitable for light-duty commercial work. This model comes with a 3-year residential warranty. While many would consider this to be the best wood chipper that you can get, its price will probably put a lot of homeowners off. Though, if you’re going to be working your wood chipper to the max, this price will prove to be worth it in time. Patriot CSV-3090H is an exceptional machine, and truly one of the best gas-powered wood chippers whether you’re a homeowner or own your own landscaping business. This is an commercial-grade product. Yes, it will cost you but you do get what you pay for. Visit the Patriot site to learn more about their line of wood chippers or read our comprehensive guide on Patriot wood chippers where we review several of their wood chipper/shredders. Features dual hardened steel chipping blades to tear branches up to 4 inches wide turning them into wood chips. Includes 6 hardened steel shredding hammers, transforming leaves and debris into fine mulch. An affordable gas powered wood chipper. As you can imagine, these are powerful machines and can also be very dangerous if used incorrectly. With all power tools, safety must always come first. You must always read the manual for the specific model you purchase as the manufacturer will always have safety recommendations for the wood chipper you purchased. I recommend you read the wood chipper SAFETY GUIDELINES from OSHA. It’s a thorough breakdown of safety procedures you should take when operating a wood chipper. Please read it. VIEW OR DOWNLOAD the Wood Chipper OSHA SAFETY GUIDELINE DOCUMENT. (Occupational Safety and Health Administration). Learn more about OSHA. You’d think that disposing of organic waste like your vegetable cuttings and garden debris would be good for the environment. In fact, it’s quite the opposite. When garden waste is compacted into a landfill site it doesn’t get the oxygen to decompose properly. What happens instead, is that the organic matter releases methane. Not only is methane highly flammable, but it’s also one of the most harmful greenhouse gases. The bad effects of organic waste on landfill sites has resulted in many sites forbidding the dumping of garden waste. So by turning your kitchen and garden waste into compost, you’re not only doing your bit towards saving the environment, but you also benefit by having free organic and harmless fertilizer for your garden. Composting is a natural process and, without the aid of human intervention, any plant matter will eventually decompose and turn into compost. However, following some basic steps will make the process more efficient and speed up the process. Firstly, let’s distinguish between mulching and composting. If you take green (fresh) garden debris directly from your wood chipper and sprinkle it onto your plant beds, this is known as mulching. The benefit of mulching is that it helps retain moisture. This means that the soil around your plants will remain moist with less watering. Mulched garden waste will eventually turn into compost, but this can take up to a year, depending on the type of plant matter and other conditions, like how much water it gets and the ambient temperature. It’s important to know that you should never dig fresh plant matter (that has not turned to compost) directly into your plant beds. The decomposition process that turns fresh plant matter into compost releases heat. The heat generated from this process can harm the roots of your plants. If you’re going to be using garden and kitchen waste as compost, you have to allow it to decompose properly before digging it into your plant beds. Having covered this, here’s a basic guide to making your own compost. First, let’s take a look at what waste is good for making compost and what is not. Always break down your composting material into fine pieces – the smaller the better. This is where your chipper is going to show its worth. Made from BPA free 100% recycled environmentally-friendly material. Now that you know what to use and what not to use, you’re ready to start making your own compost. Your first step is to set up your composting bin. You can simply pile up your garden and kitchen waste somewhere in the yard but this going to be somewhat unsightly and you probably won’t get the best airflow. Getting enough oxygen into your compost is very important, it speeds up the process and produces a better quality compost. If you’re into DIY projects, you can build a composting enclosure from a mesh. A steel or plastic mesh that’s fine enough to prevent your compost from leaking out is what you’ll need to use. It’s important to use mesh because your compost needs a good airflow, this will provide the much-needed oxygen for the decomposition process and will help to keep the compost cool. Water and air counteract the heat that is released while the organic matter breaks down. If building a compost bin is not your thing, or you don’t have the time, there are a variety of composting bins that you can buy and these products are ready for use without you having to do much assembly. A store-bought composting bin can come in many different shapes and sizes. Some are designed for areas where you don’t have much space. They all provide a neat and easy to use product. A composting bin has been made to ensure perfect airflow and many reduce evaporation, meaning that they won’t require you to add much water (if any) to keep your compost moist and cool. Many of the top-end composting bins are designed to rotate and this will mean that you never have to churn it by hand. In short, getting a good composting bin will give you perfect results in a much shorter time and the composter will do most of the work for you. A few other tools that you will need are a pitchfork or aerator. An aerator is a tool that’s designed for composting. It has a long handle that allows you to force the aerator into the compost and as you pull it out, it will churn the compost for you. A pitchfork can do the same job but will require more effort. A screen is quite important. Basically, this works like a sifter that separates the smaller, composted, pieces from large pieces that are not yet decomposed. You’ll also need a shovel and wheelbarrow. Now that you have everything you need, it’s time to start building your compost pile. It’s best to start with a pile of twigs and branches at the bottom. These should be packed loosely, to allow air movement at the base of your compost pile. Many store-bought bins may have a base that’s designed to aid airflow and you won’t have to do this if you have a bin like this. This layer should be about 4-inches thick. Before adding the next layer, soak the twigs and branches with plenty of water. From here on you will be adding your organic waste. It’s best to alternate between green matter and brown matter in layers that are about 2” thick. Green matter, which is rich in nitrogen, include food waste like vegetable scraps and peels, grass cuttings and hay, as well as most garden waste. Brown matter provides much-needed carbon to your compost and these would include fresh leaves, coffee grounds, peanut shells, sawdust, tea leaves, and newspaper strips. Your layers should be packed loosely, to allow for maximum airflow and water seepage. Once your pile reaches a height of about 3-5 feet, add some soil to the pile – a few handfuls should do the trick. Bacteria in the soil helps the process. Once this has been done, you can leave the rest to nature. It usually takes about a year for compost to mature into a rich organic fertilizer. Tough, you can reduce this time with a bit of effort. Watering your compost and introducing fresh air into the pile will speed up the process. This means adding water once or twice a week and turning the pile with an aerator or pitchfork just as regularly. If you do this regularly enough, you could have usable compost in about 3-4 months. You know your compost is ready for use when it is a dark color and the material has a fine, soil-like composition. It should have an earthy smell. Sifting your compost before using it will separate the usable compost from pieces that still need to decompose some more. You should only use compost that is fine enough to pass through a compost separator. Organic matter that has not been properly composted (large pieces) will give off harmful heat when dug into your plant beds. Compost can be placed directly onto the ground around your plants, but works best when dug into the soil about 2-3 inches deep. Mixing compost with topsoil and spreading this over your lawn will ensure a thick and lush lawn and will also help to level it out. Doing this every spring will give you the coolest and softest lawn in neighborhood.